If your property, yard or lawn is hilly or rugged, you will find pushing a mower uphill or keep it in control downhill rather challenging. It will be difficult, frustrating or even dangerous unless you get the best mower for hills to make the job easy and safe. Without the right lawn mower, you will find that mowing slopes is a tiring and not a very safe task. It’s important to choose a mower which has enough power to handle inclines, as well as the appropriate safety features. How to choose the best mower for hills? Thinking carefully about the properties of the terrain you will be mowing comes first. Most regular mowers and lawn tractors don’t operate safely when slopes are over 15 degrees. This is why the best mowers for hills are made specifically to handle the sloped terrain. As a result, they make mowing on slopes and hilly terrain safer and easier. Zero Turn (Z-Turn/ZTR) mowers - The Zero turn mowers are quite efficient on larger lawns just like other riding mowers. What makes them different is the fact that they have independent power on the rear wheels. You simply operate a Zero Turn mower using two handles which also act as brakes. Zero turn mowers are defined by their ability to make a turning of zero degrees using hydraulic speed. This means that Z-Turn mower can be turned inside its own route. Riding mowers – The best option for a riding mower is a model with larger rear wheels to increase the traction. This is important to minimize the chances of a Riding lawn mower tipping over when mowing hills. We strongly recommend that you mow when the ground is dry because most Riding mowers don't perform that well on wet slippery grass. Walk Behind mowers – Also called Stander mowers, these might be the safest option for hilly terrains as they only require you to press the navigation buttons. In addition, they allow you to position your weight whichever way will help to do the job efficiently and safely. The type of drive – rear wheel drive is the safest as it offers most traction. Mowing up and down slopes in a straight fashion is the safest option. If you’re using a walk behind unit, mow from side to side beginning at the base of the hill and moving upwards. Try mowing at a low speed as this is the safest way to go. If you are mowing from the side of a slope, look at your uphill front tire to check if it’s creating a good depression as it rolls over the grass. If you notice that there isn’t a good depression, turn downhill at a very low speed. The brakes should not be used for slowing down when you’re using a lawn tractor. The transmission on a lawn tractor is used for slowing down. Use the brakes only when you want to stop. Don’t forget that the proper brake maintenance is a must for safety reasons and for optimal operation. The brakes should be maintained and adjusted regularly. User manuals often contain maintenance instructions. Read them carefully and follow them. Your lawn tractor may flip back while you’re riding it uphill as you’re mowing. If you notice that the front end is coming up, the rear wheels are going to give the lawn tractor the force which flips it back! Some of the older Zero-turn mowers don’t have the right weighting for mowing hills task. They tend to tip over in a backward direction. If you find that you’re not able to back up a slope, avoid mowing it with a ride-on mower. Try to use a lawn tractor for moving upwards and downwards on a hill. For extremely tight spots, you should take your best cordless grass shears with you. They are light, portable and will do the job around bushes and on all edges next to trees or rocks. Do not mow grass which is damp or wet. You will find that your tires don’t have good traction. In addition, avoid mowing on grass which is very dry, due to drought. In this case, tires won’t have adequate traction either. This is a safety issue so we recommend not mowing near embankments, drop-offs or ditches and close to ponds. The tall grass near the edge of water will always be water-logged. Because of this, your mover will sink into the turf and there is a high risk of tipping over. Husqvarna 961450021 HU800AWDH Honda 190cc 3-in-1 All Wheel Drive is efficient and ergonomic mower for hills with a reliable and easy-starting engine, as well as powder, coated cutting deck. This mower for hills comes with a reliable and powerful Honda engine with 190cc and 4-cycle performance. The twenty-two inch, the powder-coated cutting deck is designed to be ultra-durable. If you prefer all-wheel drive power, you’ll find this mower well-performing on different types of terrain. To start mowing, you need to squeeze the trigger found on the mower’s handlebar. You can also use the trigger to adjust and maintain speed. Husqvarna HU800AWDH provides improved maneuverability in all types of grass or terrain. Its 3-In-1 Steel Mower Deck gives you the option to side discharge, mulch or bag your grass as well. The Ball Bearing front wheels are 8-inch and the rear wheels are 11-inch in diameter. Auto Walk Self-Propelled All Wheel Drive System is a variable drive system which allows you to mow at your own preferred pace while having good traction provided by the wheels. This lawn mower weighs one hundred and five pounds. Since it’s a self-propelled style, you’ll find that using it on hills and flat terrain is convenient and safe, as long as you stick to the safety advice and procedures. If you get yourself into a tough spot that needs to be backed out of, you may have a hard time pulling the mower backward. Although not a deal breaker, make a note of this and plan your mowing route accordingly. For the price, Husqvarna HU800AWDH walk behind the unit is one of the best mowers for hills available today. The combination of the powerful Honda motor, the build quality of the body and the powerful 4WD self-propelled feature make it a great option for most needs. Honda HRR216K9VKA 3-in-1 Variable Speed Self-Propelled Gas Mower is a gas mower with impressive features and performance. We found this mower to be designed well while packing enough power to ensure a clean, smooth lawn even on hilly terrain. This self-propelled mower for hills is a variable speed unit with a max speed up to four miles per hour. It’s easy to start up and comes with a GCV160 motor. 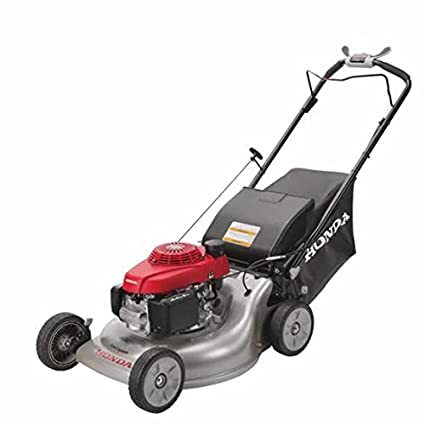 Honda HRR216K9VKA is an EPA-compliant unit and features an auto choke system and two-position handles with foam grips for more comfortable mowing. The handle height is moderately low at 41 inches. This makes the mower easy for you to operate if you are not really tall or strong. Its twin micro-cut blades allow for a fine cut, which is convenient for bagging and mulching. There are six cutting positions so you can adjust it based on how tall your grass is. The rear wheels are variable, giving this lawn mower strong self-propulsion. The wheel height is adjustable to four heights, giving you the freedom to set the mower at a fitting level for your lawn. Honda HRR216K9VKA comes with a safety system called Zone Start which shuts down the motor when the operator lets go of the flywheel lever. With a user-friendly design and reliable performance, this lawn mower is a solid choice. Troy-Bilt TB330 163cc 21-inch 3-in-1 Rear Wheel Drive Self-Propelled Lawnmower features a rear wheel self-propelled drive system for increased traction as well as dual lever, variable speed selection for precise speed control. While mowing with this unit from Troy-Bilt, you can easily raise and lower cutting height with the single-lever height adjuster. And with the capability to side discharge, mulch or bag, this mower for hills provides added versatility to handle hilly terrains. The good thing about the Troy-Bilt TB330 is that the adjustments are all made using a single lever. This means no more awkward fumbling and multiple hardware features to change the height. It is especially useful if operators who will be using this mower are of different heights. The handle folds down to make the mower easier to store, but this mower can’t be stored vertically. If shed or garage space is truly an issue for you, consider buying a smaller unit. Truthfully, performance on slopes should be your main consideration and not the convenient storage. The TB330 from Troy Bilt is a simple mower, but this simplicity has a great value. This unit is a jack of all trades and pretty good at almost all aspects of mowing including hilly terrains. It is the ideal mower for a first-time buyer who wants a nice all around machine without breaking the bank. Troy-Bilt 382cc 30-Inch Premium Neighborhood Riding Lawn Mower allows you to do your lawn work with less exposure to exhaust since the engine is in the back. The 6-speed transmission lets you mow at your own pace and the Operator Control Reverse lets you mow backward. The powerful and reliable overhead valve engine gives you a better fuel economy and runs with less vibration. You can maneuver easily with the 18-inch turning radius, along with the manual power take-off (PTO) for easy and fast blade engagement. The durable 13 x 5 inches front wheels and larger 16 x 6.5 inches rear wheels are reliable and built to last. The Troy-Bilt Riding Lawn Mower with 30-inch cutting deck combines the advantages of a standard riding lawn mower with the size of a wide cut walk behind mower. You can easily store it in the garage or shed. This unit is ideal for standard landowners with a medium sized landscape and relatively even terrain but does quite well on slopes if you follow the safety tips and avoid wet grass. The powerful 382cc OHV engine is built to last and provide clean performance. Its fuel 1.3-gallon tank has a fuel sight window which allows you to check gas levels. This mower features a 5 height adjustable blade with a manual power take-off for easy and fast blade engagement. Finally, for added comfort, the seat can be raised to mid-back and the steering wheel is a 13-inch soft grip wheel. Troy-Bilt offers a 2-year limited warranty with extensive coverage to give you the durability you should expect at this price point and from a reputable brand. Also check out more top rated riding lawn mowers at https://www.gardenaware.com/best-riding-lawn-mower/. Cub Cadet XT1 Enduro Series Gas Front-Engine Riding Mower is one of the very few mowing tractors in the budget-friendly zone that can take on steep slopes of 10 to 20 degrees incline easily. It features a robust 22HP, 725cc engine from Kohler which cuts through the toughest grass varieties on hilly terrains. As for the power and speed capabilities, you should be careful with speed control on the slopes. We recommend that you always keep one foot on the brake/clutch pedal. Once you’re well-versed with the controls, you’ll be able to cruise as fast as 5.5 mph forward and 3.1 mph in reverse. This mower provides 12 cutting heights between 1 to 4 inches. All you need to do is lightly drag the single lever across the height markings, and you’re good to go. What about the traction on this unit? The front wheel measured at 15” and rear wheel measured at 20” offer great traction and ideal maneuverability for all kinds of turfs. The ergonomics of this riding mower is also great, from the handles to the seat which is non-slippery, oversized and with elevated back-rest. Convenience wise, the gas tank is quite large with the capacity of 3 gallons. You won’t need to worry about frequent re-fuelling. The sight-gauge on the tank makes it easy to check the fuel level. One con to be noted is that the front axle starts to squeak after a couple of uses so you need to add some greasing every now and then. The other con is that the adjustable levers on the fender as well as the one next to the driver’s seat are made of not-so-sturdy plastic. Overall, a solid riding mower for hills! We also recommend reading our best self propelled lawn mowers reviews! 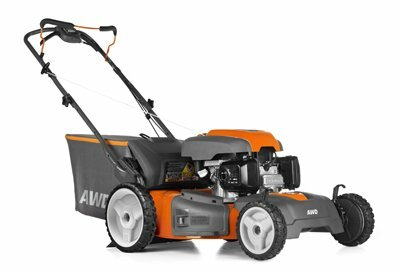 2 How to choose the best mower for hills?